Reemer, M., 2010: A second survey of Surinam Syrphidae (Diptera): introduction and Syrphinae. Tijdschrift voor Entomologie 153 (2): 163–196. Steenis, van J. & H. Hippa, 2012: Revision and phylogeny of the Oriental hoverfly genus Korinchia Edwards (Diptera: Syrphidae). Tijdschrift voor Entomologie 155: 209–268. Miranda, G.F.G. 2017. Revision of the Hybobathus arx and Pelecinobaccha summa species groups (Diptera: Syrphidae). Zootaxa 4338(1): 1–43. doi: 10.11646/zootaxa.4338.1.1. Reference page. Marín-Armijos, D., Quezada-Ríos, N., Soto-Armijos, C. & Mengual, X. 2017. Checklist of the flower flies of Ecuador (Diptera, Syrphidae). ZooKeys 691: 163—199. doi: 10.3897/zookeys.691.13328. Reference page. Ricarte, A. & Marcos-García, M.A. 2017. 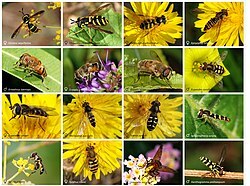 A checklist of the Syrphidae (Diptera) of Spain, Andorra and Gibraltar. Zootaxa 4216(5): 401–440. doi: 10.11646/zootaxa.4216.5.1. Reference page. For more multimedia, look at Syrphidae on Wikimedia Commons.